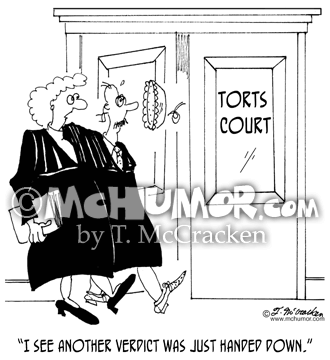 Law Cartoon 5302: A judge saying to another, "I see another verdict was just handed down,” as a pie flies out of the Torts Court. 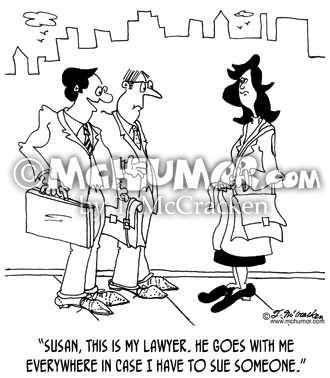 Lawyer Cartoon 5461: A man introducing another says, "Susan, this is my lawyer. He goes with me everywhere in case I have to sue someone." 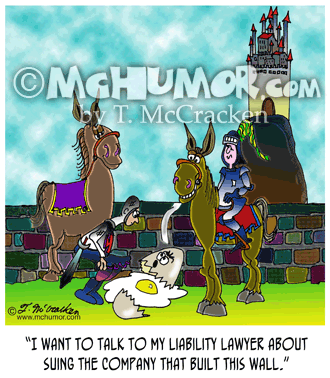 Mason Cartoon 3007: Humpty Dumpty says to the King's Men, "I want to talk to all the king's lawyers about suing all the king's stone masons who built this wall." 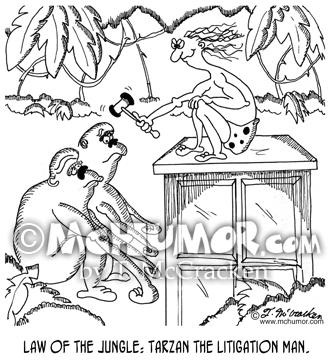 Litigation Cartoon 6514: "Law of the Jungle: Tarzan the Litigation Man." In the middle of a bunch of trees and vines, Tarzan holding a gavel squats on a judge's bench before a couple of gorillas. 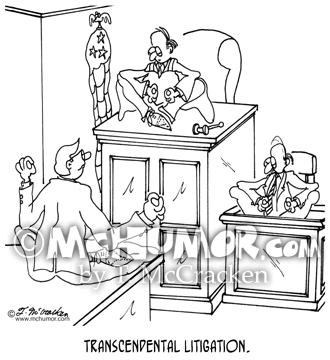 Litigation Cartoon 5457: "Transcendental Litigation." In court a judge, lawyer and man on the stand sit in yoga positions. 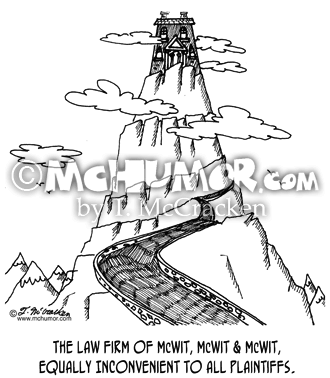 Law Cartoon 5624: At the top of a cliff is, "The Law Firm of McWit, McWit & McWit, Equally Inconvenient to all Plaintiffs." 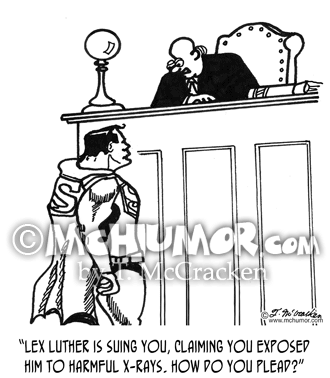 Libel Cartoon 2691: A student saying to a teacher, “Ms. 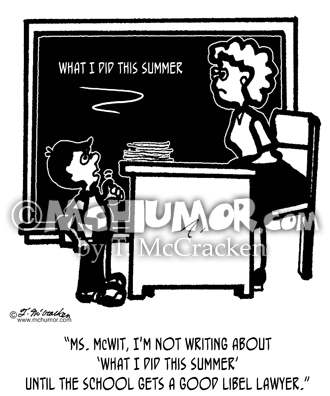 McWit, I'm not writing about 'What I did this summer' until the school gets a good libel lawyer." 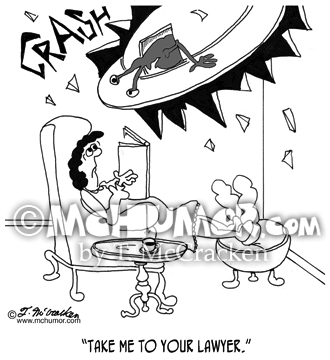 Lawyer Cartoon 6513: Climbing out of a UFO that's crashed into a house a space alien saying, "Take me to your lawyer." 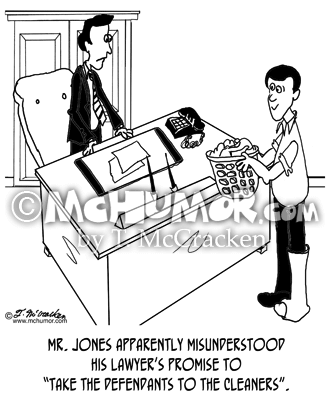 Laundry Cartoon 8383: A client hands a laundry basket to a lawyer. “Mr. 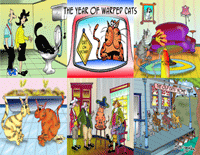 Jones apparently misunderstood his lawyer’s promise to ‘take the defendants to the cleaners'."